The Missouri Ozarks and Table Rock Lake combine to provide a beautiful backdrop for one of the sporting world’s truly unique events: The Bass Pro Shops Legends of Golf presented by Big Cedar Lodge. The Legends of Golf returns to the Ozarks April 24-28, 2019 for the fifth time! Bass Pro Legends of Golf is a stop on the PGA Champions Tour where two-man teams compete for the Legends and Champions crowns, alternating play between the Top of the Rock and Ozarks National golf courses. The inaugural event in 2014 drew the likes of Jack Nicklaus, Top of the Rock course designer, Gary Player and Tom Watson, to name just a few. This tournament event includes team play and gives golfers from the PGA Champions Tour the opportunity to showcase their skills alongside celebrities like Justin Timberlake, Mark Wahlberg, Kid Rock and more in the pro-am portion of the tournament. 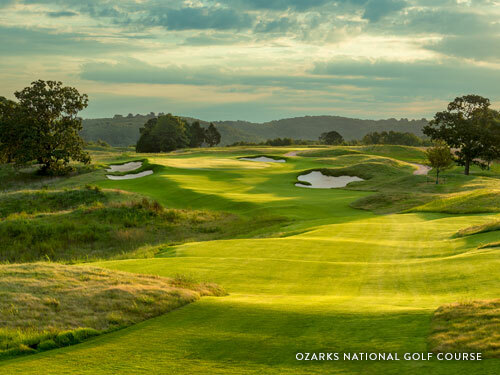 Ozarks National Golf Course was created by Coore, Crenshaw, and Johnny Morris—noted conservationist and founder of Bass Pro Shops. This is a golf experience that immerses players in the beauty of the Ozarks terrain. The 18-hole course, which measures 7,036 yards from the back trees, is masterfully carved into the landscape, producing holes that both challenge golfers’ games and delight their senses. The most visually unique feature at Ozarks National might be the 400-foot wooden beam and plank bridge on the 13th hole that towers 60 feet above a rushing creek, but each turn of the course brings new sights that connect players to the nature around them. Top of the Rock Golf Course is a nine-hole, par-three course designed by Jack Nicklaus. Two sets of tees allow for 18 holes of play, with different challenges. The site is a nature-based heritage preserve also created by Bass Pro Shops founder Johnny Morris. The facility includes an Arnold Palmer-designed practice facility with 18 target greens, plus a 70,000 square-foot "Himalayan" putting course designed by Tom Watson. Top of the Rock is home to Arnie’s Barn, a classic 150-year-old barn which was moved to the site from Latrobe, Penn. ; it serves as a stunning restaurant, bar and golf pro shop. Information for spectators is found on the tournament’s website. Along with golf and the pro-am activities, Legends of Golf gives spectators the opportunity to tour the Top of the Rock facility and admire the stunning views of Table Rock Lake and the Ozark Mountains. After watching the Legends event, you’ll likely have a little golf fever. Extend your stay and find a cure for that fever at one of the Branson area’s many fantastic courses, several of which are connected to resorts. Pair a long weekend with great golf, Branson’s live shows, outstanding dining options, fun attractions and shopping, and you’ll consider yourself the real winner. 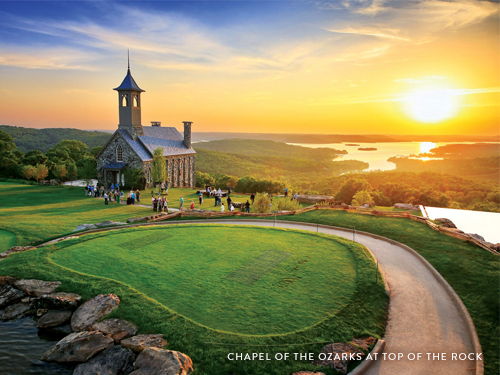 Learn more about a golf-focused Branson adventure today.